Wei Ding 9P and Dalhoon Ahn’s 9P winning streaks in the US Open Masters ended Tuesday morning as they were defeated by Bin Fu 7d and Andy Liu 1P. That means there are now five players with 4-1 records (Ryan Li 1P is the fifth). Ahn “made two mistakes in the opening, and I got the better of him on two corners,” Liu told the E-Journal. “After that I had a pretty good lead.” Ahn “didn’t make any mistakes after that and was able to catch up a bit, but I just played really carefully.” Holding onto his lead “was really nerve-wracking,” Liu cheerfully admitted, “but I’m really good at managing my emotions now. I had some problems in the past winning won games, but now I know how to play safely.” He says he’s been watching a lot of AI games, “and they’re really good (at winning won games); they always keep their lead. 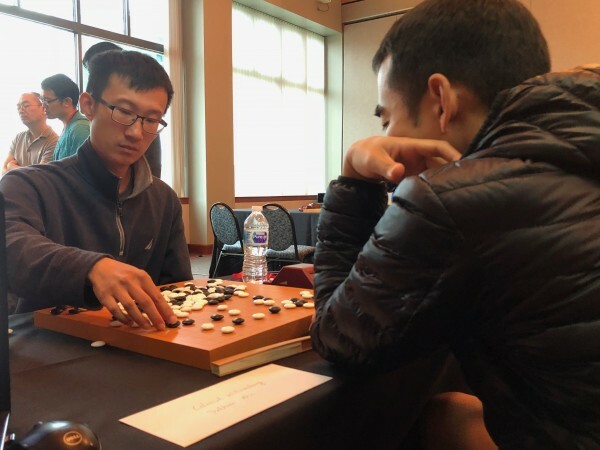 So that was going through my head, how would a top AI keep its lead?” “This shows how good US pros are,” said Pro Coordinator I-Han Lui. “Now everyone has a chance at the title.” Round 6 is scheduled for Thursday morning; watch live on KGS, Twitch or YouTube.